It would be hard to express our gratitude towards Timken for all the help they have provided the team with over the last several months. Not only are they the only company to be found that produces a bearing capable of the weight and speeds of the next bullet but also their engineering advising has helped the team reach a final solution for the VBB3 upright at last. A few days ago we received a nice gift from our friends shown above. 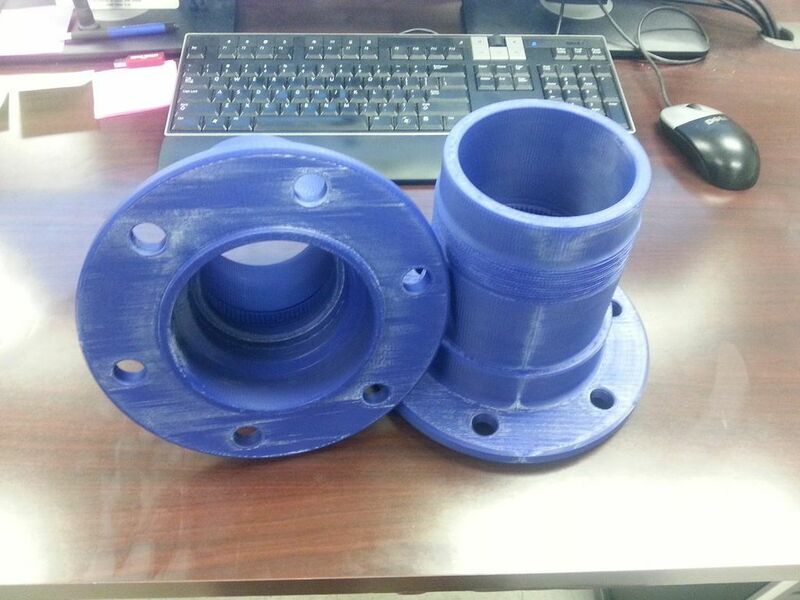 In the picture are two 3D printed prototypes of what will be the wheel hubs for the car to be built this summer. A nice shelf piece for sure, great for showing off when visitors stop by and proof that yes, in fact, this thing does have wheels. Thanks again to everyone who has helped us out at Timken, you guys are awesome. Would love to know who you worked with at Timken. I am an alum from the "Smokin' Buckeye" days and worked at Timken for 9 years after graduating the university. I still have many good friends and colleagues at Timken. They are a great company.
" A nice shelf piece for sure, great for showing off when visitors stop by and proof that yes, in fact, this thing does have wheels. " I was just there on Tuesday, and saw those parts, they are indeed slick !